What is the difference between mobile-first website design and responsive website design? Which approach is better for your business? To answer these questions, as always, you need to know who your audience is, how they access your site and what actions you want them to perform. What is the difference between mobile-first website design and responsive website design? Which approach is better for your business? To answer these questions, as always, you need to know who your audience is, how they access your site and what actions you want them to perform. Are people accessing your website on the move or while sitting behind a desk? Are they using Wi-Fi or 3G connection? Once you have the answers to these and many more, you can make an informed decision on which design is best suited to your new website. What is the difference between mobile-first and responsive design? Firstly, there is often a little confusion when it comes to these to concepts. Many people mistakenly think they are one in the same when they are entirely different. Responsive design starts on the desktop; that is, at the maximum required resolution, and then scales down to the smallest screen. Even though the content and layout contract to fit smartphones, the navigation, content and download speeds are geared more for your traditional website. Mobile-first design is similar to designing a mobile app and then adapting the layout that it can be viewed neatly on tablet and desktop devices without too many modifications. Your whole design and layout are based on providing excellent mobile user-experience: fast download speeds, rich media content to keep your target audience interested, easy touchscreen navigation and so on. Generally, responsive design is more common among B2B companies where the website content needs to be informative and authoritative. Rich HTML content that is structured correctly is also great for SEO. As a digital agency, we are mainly targeting other businesses, and we know that 80% of users are on a laptop or desktop and they are accessing our site during office hours. As such, responsive design is the best approach. The Darwin Digital content, navigation, and layout are responsive to smartphones and tablets, providing an excellent UX for our mobile users. Responsive design sounds good, we hear you say. Why should you risk a mobile-first design? Quite simply, the stats show that we have become addicted to surfing on mobile devices. 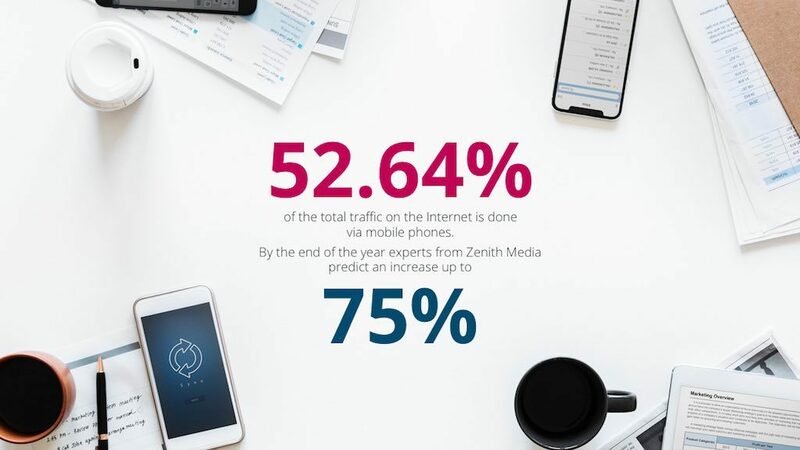 Currently, 52.64% of the total traffic on the Internet is done via mobile phones, and by the end of the year experts from Zenith Media predict an increase of up to 75%. With this information in mind, it is essential to understand what mobile-first design is and what its benefits are. 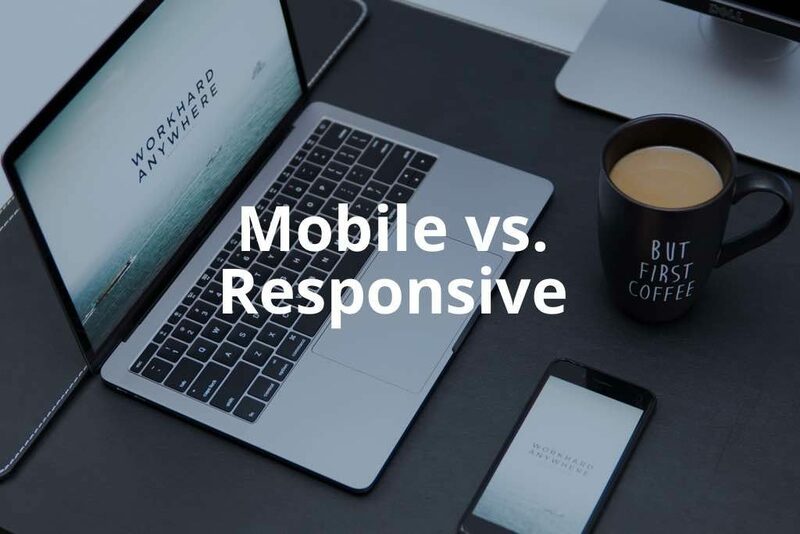 Unlike responsive design, mobile-first is about a complete mobile user-experience: adapted app-like user-interface, less text, larger fonts, fast download speed, video and audio, one call-to-action per page, short forms, etcetera. Additionally, mobile browsers shortly will have access to more of the smartphone features like camera, haptic feedback, voice detection, so that a mobile-first design will be able to provide a unique experience to put your site ahead of the competition and drive traffic. This is a relatively easy decision to make: use the 80-20 rule. If 80% of your target audience is on desktop use, responsive design; if 80% are on mobile phone use mobile-first. Great you say, but what if my users are split 50-50? You need to see where the usage trends are going, what your budget is and where your business will be in 3 years. If your business is entirely digital and providing an excellent user-experience cannot be ignored, maybe you should create two distinct sites adapted specially for both desktop and mobile users. Where can you get this info? Start by using your Google analytics. This will give you great information about how and when people are accessing your site. You should also research industry statistics for what the usage is for your market. For example, if you have a restaurant website in New York, then mobile usage should be well above 80%. Another great way to get information is to do some user testing and talk to as many of your clients as possible. At the end of the day, if someone browsing your website has a ‘bad’ user-experience, there is only a 20% chance they will come back!